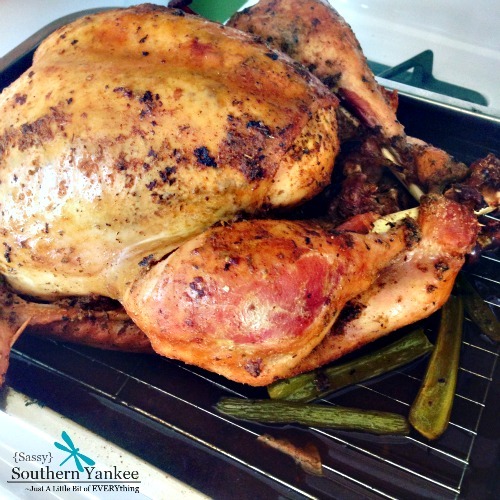 Mix up your Thanksgiving turkey with the Best Oven Roasted Cajun Turkey. Extra juicy with hints of heat make for the perfect twist on a Holiday favorite. I hope you enjoy it as much as I did! Preheat the oven to 400*. In a large roasting pan place a baking rack; then spray the pan and rack with non-stick spray. Remove the turkey from the brining mixture and pat dry with paper towels. This year I named my turkey LuLu but you can name yours whatever you like. In a glass bowl melt the butter in the microwave then add all of the spices. You can do this a few days ahead of time then just remelt the butter to make your life easier and it gives the spices a change to “wake up”. Remove the turkey from the brine bag discarding the brining liquid and brine bag (don’t reuse the brining bag or liquid). Place LuLu onto your baking pan that you plan to roast her in. Using paper towels pat the turkey to remove excess liquid. This helps the Cajun goodness stick to LuLu. If you haven’t done so already now would be an opportune time to remove the turkey innards (organs) from the cavity of the turkey. Using your hand gently separate the skin on the breast bone area, so that you can spoon in the Cajun mixture. This allows the mixture to melt in between the skin and the meat giving you a juicy and delicious tasting turkey. Do the same things on the leg area, so you can sneak flavors in there as well. Take your Cajun butter mixture and using a spoon or your hands place the mixture under the skin on the breast bone area, legs and inside of the cavity. Turn LuLu over then rub the Cajun mixture on her backside. Place the pan in the *400 oven for 30 mins. This allows the backside of the turkey to brown up a bit and helps gravity move the juices to the breast area. After 30 mins remove LuLu from the oven and using a tea towel or turn the turkey over in the pan (caution turkey might be hot). If you plan on stuffing the turkey this is when you want to fill the cavity full of whatever your favorite stuffing recipe is. Once you have LuLu stuffed be sure to fold her legs back into the cavity area to hold them in place or feel free to use some cooking twine. Fold the wings behind the “head” of the turkey to prevent burning. If you are cooking stuffing in a separate pan then place a half onion and some celery in the cavity to add flavor and moisture. Add the chicken stock to the bottom of the pan; cover the turkey with a piece of parchment paper then some foil paper (if you don’t have parchment paper foil is fine). LuLu is now officially ready for the oven. Reduce the oven temperature to 325* and bake according to package directions. **Follow the Turkeys package instructions for cooking times. Please keep in mind that stuffed turkeys take longer to cook than unstuffed turkeys and the breast meat should reach a temperature of 161* and the Thigh/dark meat should be 180* to avoid food poisoning. Remove the foil and parchment paper about 45 prior to the end of the cooking time to allow LuLu to get nice and golden brown making sure you baste her with the drippings and juices about every 15 mins. Once the turkey reaches the proper temperatures remove it from the oven then allow to sit for 30 min to 1 hour prior to carving this allows the juices to redistribute making for a juicer turkey. Don’t worry LuLu will stay plenty warm. 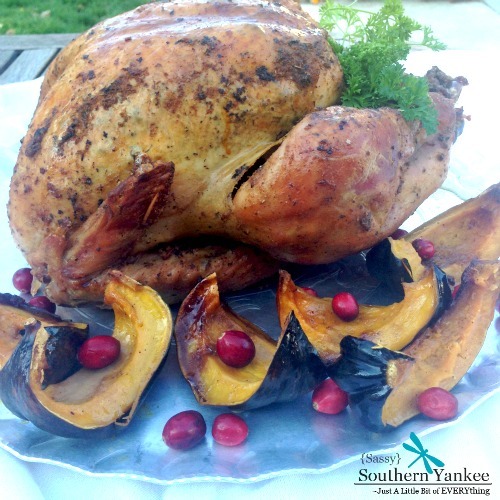 Mix up your Thanksgiving turkey with the Best Oven Roasted Cajun Turkey. Extra juicy with hints of heat make for the perfect twist on a Holiday favorite. In a glass bowl melt the butter in the microwave then add all of the spices. You can do this a few days ahead of time then just remelt the butter to make your life easier and it gives the spices a change to "wake up". In a large roasting pan place a baking rack; then spray the pan and rack with non-stick spray. Remove the turkey from the brine bag discarding the brining liquid and brine bag (don't reuse the brining bag or liquid). Place LuLu onto your baking pan that you plan to roast her in. Using paper towels pat the turkey to remove excess liquid. This helps the Cajun goodness stick to LuLu. If you haven't done so already now would be an opportune time to remove the turkey innards (organs) from the cavity of the turkey. After 30 mins remove LuLu from the oven and using a tea towel or turn the turkey over in the pan (caution turkey might be hot). If you plan on stuffing the turkey this is when you want to fill the cavity full of whatever your favorite stuffing recipe is. Once you have LuLu stuffed be sure to fold her legs back into the cavity area to hold them in place or feel free to use some cooking twine. Fold the wings behind the "head" of the turkey to prevent burning. If you are cooking stuffing in a separate pan then place a half onion and some celery in the cavity to add flavor and moisture. Add the chicken stock to the bottom of the pan; cover the turkey with a piece of parchment paper then some foil paper (if you don't have parchment paper foil is fine). LuLu is now officially ready for the oven. Reduce the oven temperature to 325* and bake according to package directions. Remove the foil and parchment paper about 45 prior to the end of the cooking time to allow LuLu to get nice and golden brown making sure you baste her with the drippings and juices about every 15 mins. Once the turkey reaches the proper temperatures remove it from the oven then allow to sit for 30 min to 1 hour prior to carving this allows the juices to redistribute making for a juicer turkey. Don't worry LuLu will stay plenty warm. 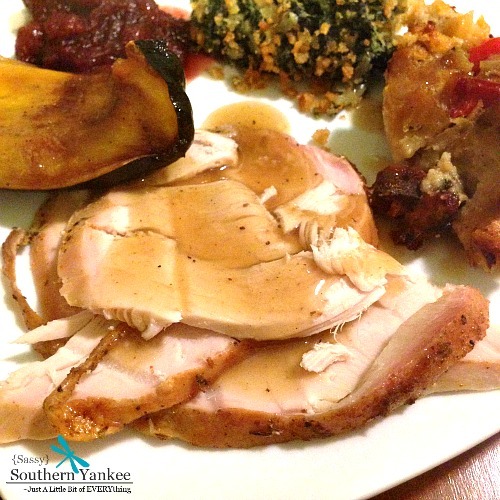 This entry was posted in Main Course and tagged Brined Turkey, Butterball, Cajan, Cajan Brined, Cajun, Cajun Brined, Christmas, Classic Southern Food, Flavorful, Oven, Roasted, Roasted Turkey, Southern Recipes, Southern Twist, Thanksgiving, Turkey. Good Evening Libby! 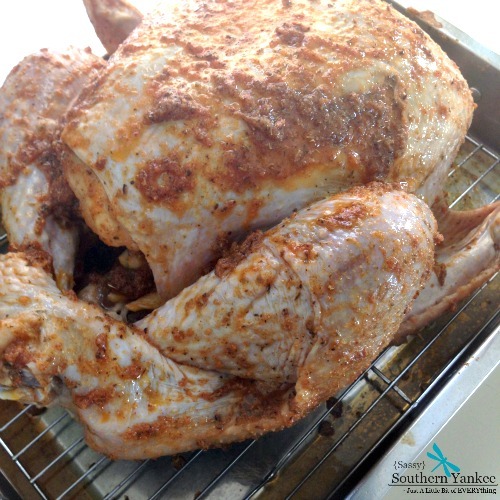 I use my Cajun Brine recipe located here http://sassysouthernyankee.com/2015/11/cajun-brined-turkey/ I hope this helps. Please let me know if you have any additional questions. Have a wonderful holiday!